This panel can generate point, line, rectangle, triangle or hexagon features inside a polygon. 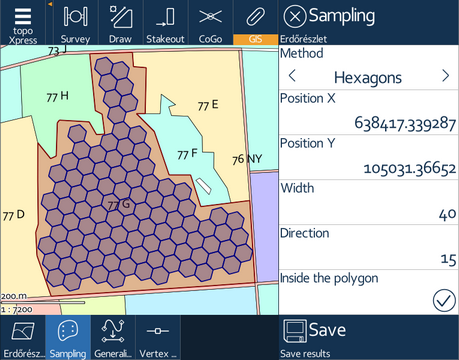 In order to use this panel, you need to Select an output GIS layer and select a polygon on the map where the new elements will be created in. Position X: easting coordinate of the starting point (southwest corner) of the feature generation. Position Y: northing coordinate of the starting point (southwest corner) of the feature generation. Width: horizontal (easting) size of the generated feature or the horizontal distance between points. Height: vertical (northing) size of the generated feature or the vertical distance between points. Direction: rotates the generated features around the starting position in degrees. Inside the polygon: a switch to generate feature only within the selected polygon. Save: this button saves the generated features into the selected GIS output layer; otherwise it will be displayed on the map, but only temporary.